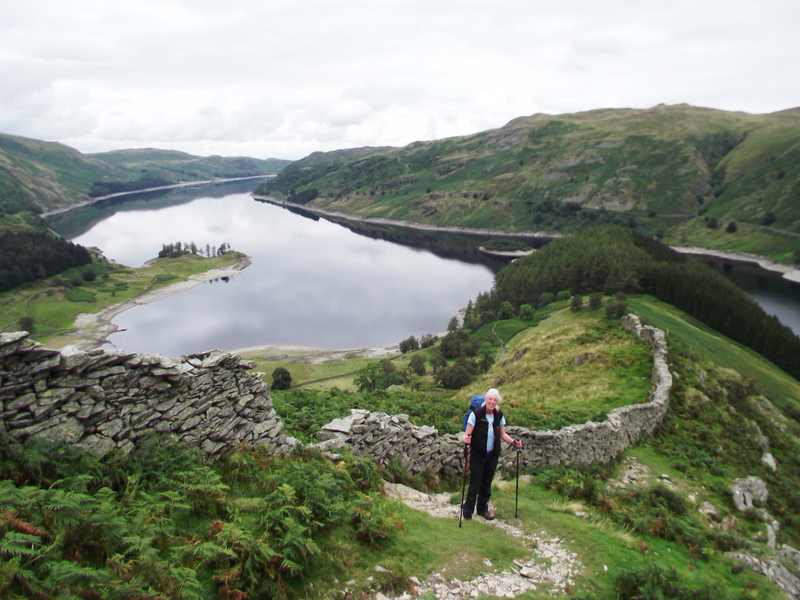 A walk up and down the High Street might not seem to be the first choice for a mountain day, but lovers of the Lake District will soon put you right. 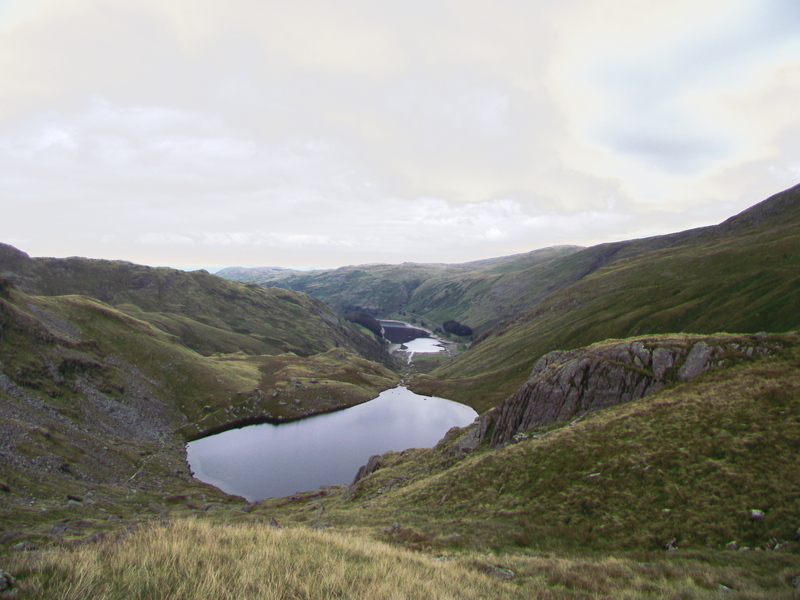 On the eastern side of the Lake District National Park, a long high route over the mountains runs from Troutbeck near Windermere to Tirril near Penrith. It is mostly famous for being a route that the Romans used between their forts at Brocavum (Brougham) near Penrith and Galava at Ambleside. It became known as ‘High Street’. The Romans knew a good thing when they saw it, but it’s almost certain that they were not the first to use this ‘Super Highway’ – the British tribes before them probably used this route in preference to the dense forest at lower altitudes, and the Romans, with typical efficiency, would have realised that there was less chance of being ambushed by the locals by taking the ‘High Street’. In the 18th and 19th centuries the locals had another use for High Street – being at the hub of several ridges, the mountain was the logical meeting place for shepherds from the surrounding valleys. In July they would meet to sort out the sheep that had strayed off their ‘patch’. An annual fair was held with wrestling, horse racing and possibly a bit of drinking. 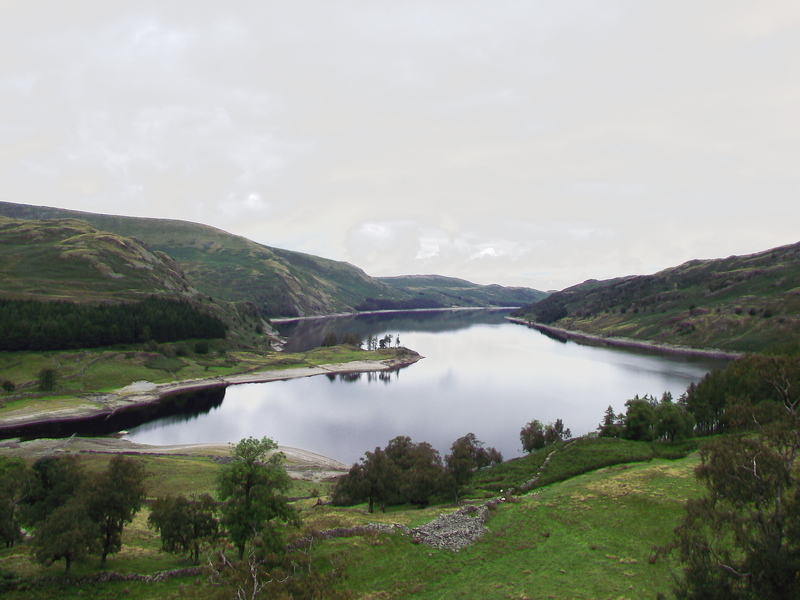 The fair was last held in 1835, but the shepherds’ meets continued at the Dun Bull pub at Mardale Head until the valley was flooded to make a reservoir in 1935. The last human inhabitants of Mardale Head left here when the village was demolished prior to the flooding. Since then the residents have been sheep, foxes and the last pair of golden eagles to nest in England. Unfortunately the female died in 2004, but the solitary male still lives in Riggindale – the RSPB hope that a female may still move into the area to make a new breeding pair. I first discovered these hills after joining Penrith Mountain Rescue Team in 1981. 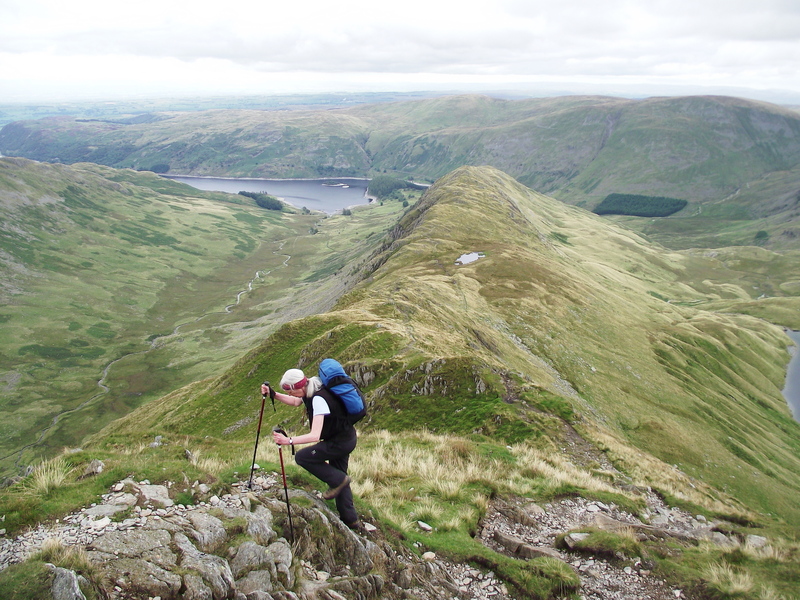 The team has a huge area stretching from Cross Fell in the Pennines to High Street, and much of the team training was done in the hills above Mardale. I hadn’t been back here for over ten years but a spare day appeared out of nowhere – I already had a tentative arrangement for a hill day with John, who is getting fit for a trip to Kilimanjaro. 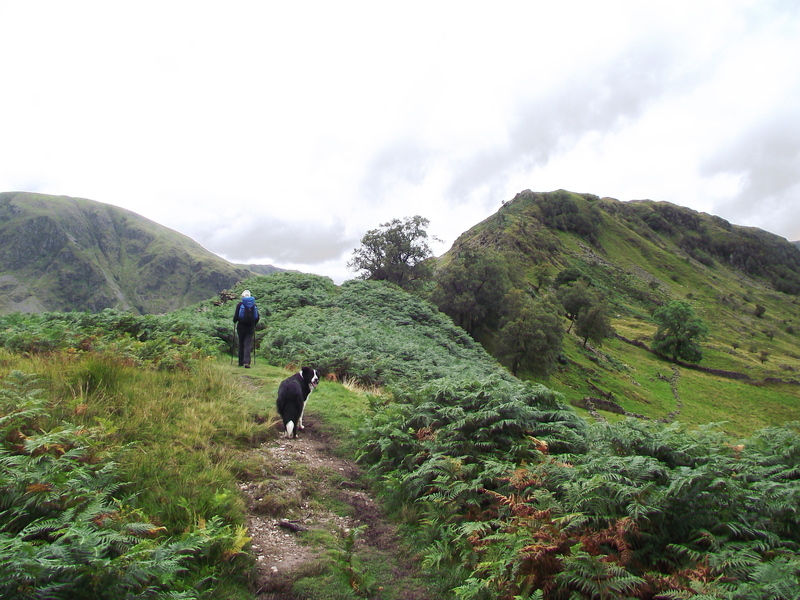 Chris and Border Collie ‘Mist’ were also ready for a good walk out, so a return to High Street was in the frame. 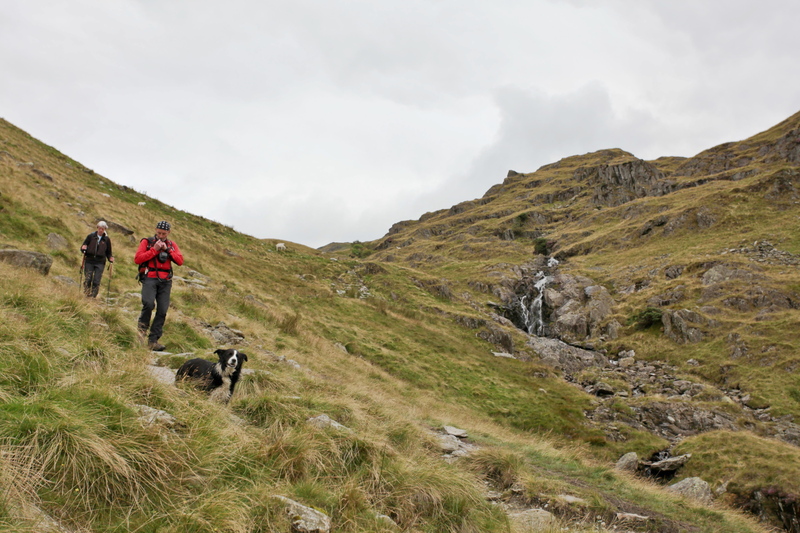 Our route was up the long Riggindale Ridge to the summit, to return by Nan Bield Pass and Small Water. I’ve done this route more times than I can remember, and always in this direction – the long ridge leads enticingly to the summit which remains hidden right until the very end. 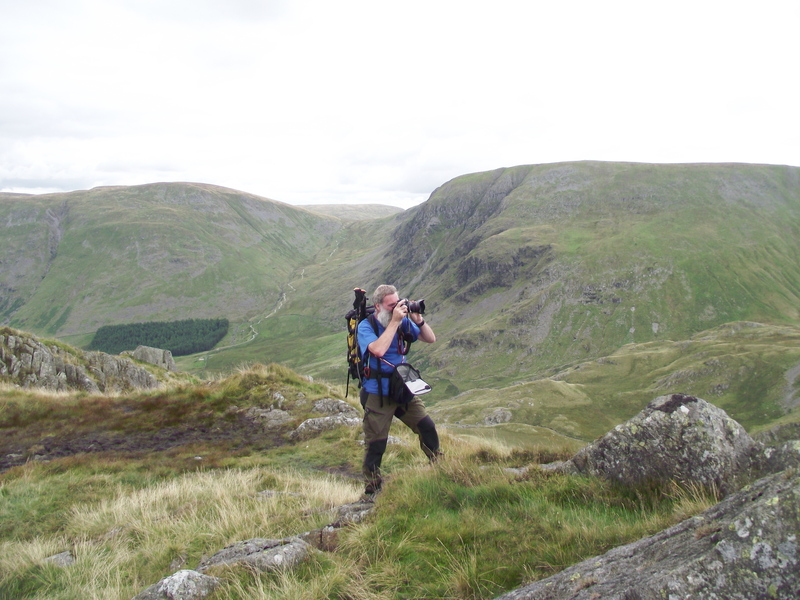 The ridge is a fantastic vantage point for views into Riggindale and the hollow of Blea Water, and our roaming photographer John Bamber was kept busy. Unfortunately there wasn’t much at the summit to inspire photography, apart from moody, gloomy shots over nearby hills, and the summit itself is far from inspirational – those Roman soldiers were probably glad to hit the downhill route towards Penrith. 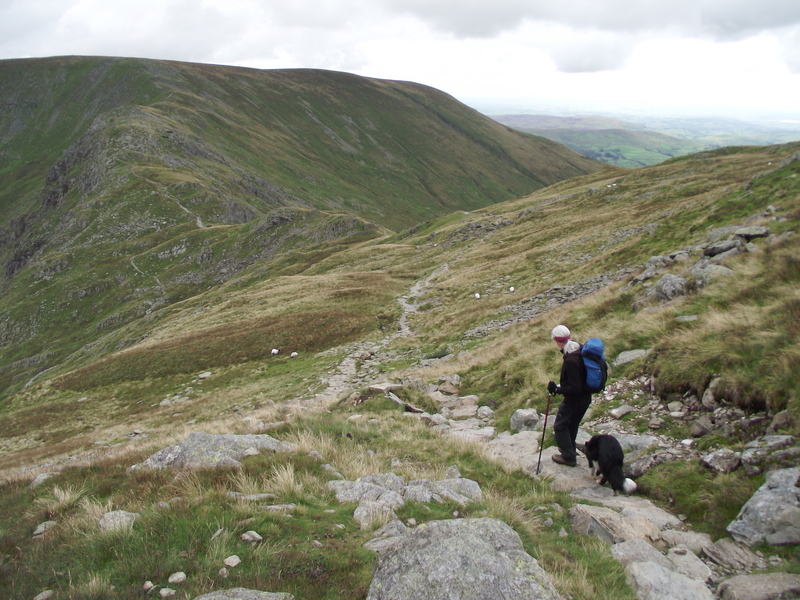 Our downhill route led a different way, to the ancient way from Mardale to Kentmere via Nan Bield Pass. 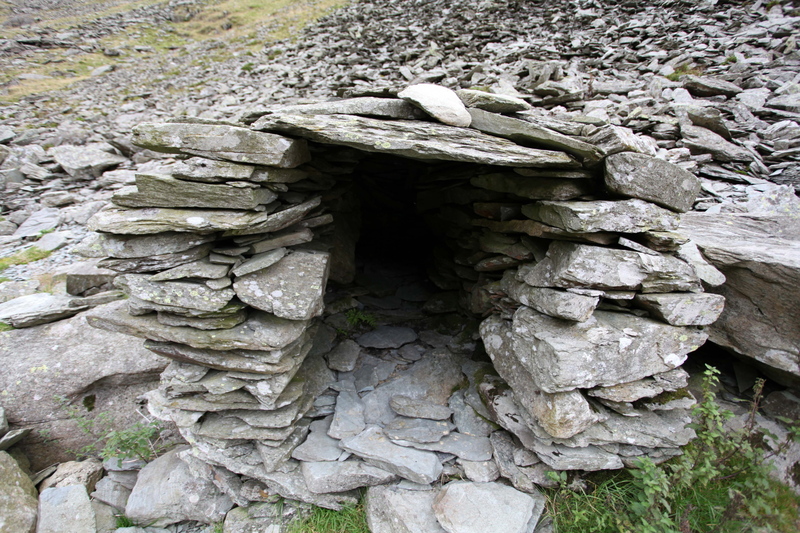 There is still a stone shelter for travellers at the pass and a group of strange ‘dog kennel’ like shelters at Small Water. 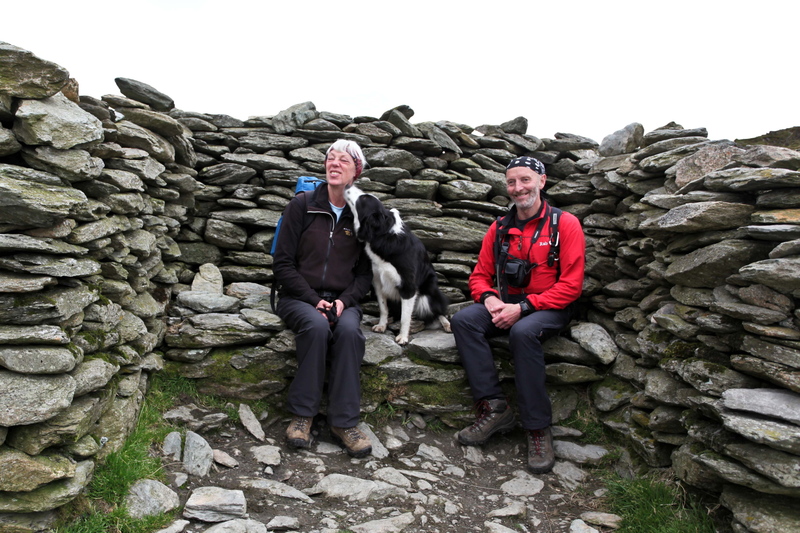 Shelter wasn’t in mind on our final descent from the pass to Mardale Head. We had started late and still had a 2½ hour journey back to Shipley via John’s home near Kendal, but there was still time for the dog to have a splash at Small Water, and for us to admire the cascades of Small Water Beck as the stream dashes down to the lake below. p.s. – Thanks for dropping in and reading. If you enjoyed the blog, please share on FaceBook, Retweet on Twitter, or subscribe by clicking the “Sign me up” button for email updates. Here every Monday morning with a hill or two to share with you. This entry was posted in 2. 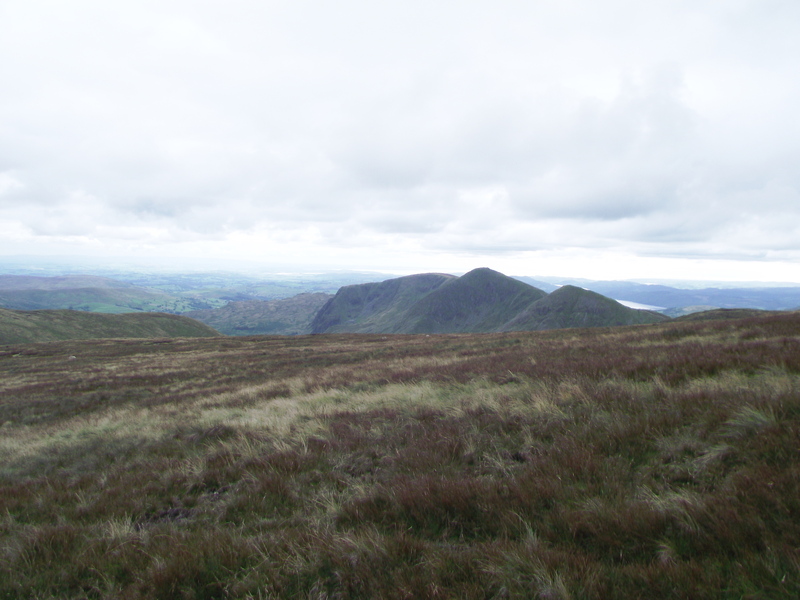 Lake District and tagged Cumbria, High Street, hillwalking, Mardale, mountains. Bookmark the permalink. Paul, always enjoy your posts, because you give a bit of history to the area you are walking as well. 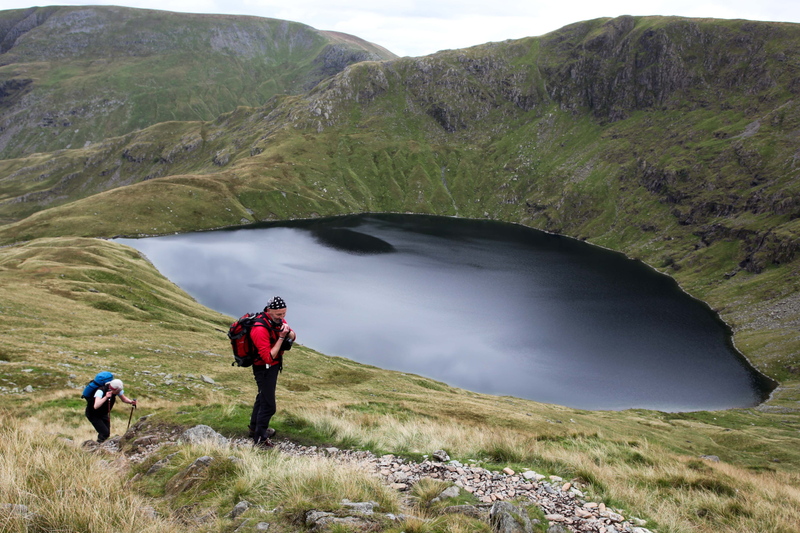 One of my favourite overnight backpacks was to go early evening in the summer and do the Kentmere Horseshoe and camp up on Ill Bell and then up to High Street in the morning. Great trip with no-one about until late morning. Hi Mark, and thanks for the kind words. I’ve spent some nights up on those hills as well – on one occasion two of us went up with our search dogs to do some night training followed by a bivi. Some poor bloke had the same idea, and had settled down for the night at Nan Bield. He was woken at about one in the morning by two barking Border Collies – he’d recently read “The Plague Dogs” by Richard Adams, and just about s**t himself when our dogs burst in on him!